ACRL is accepting applications from prospective curriculum designers/presenters to create professional development offerings to provide support for librarians as they incorporate the Framework for Information Literacy for Higher Education into their practice. The curriculum designers will plan and develop learning experiences for face to face and virtual learning contexts. The in-person workshops will be offered upon request on a licensed basis, as with the existing ACRL workshops on Planning, Assessing, and Communicating Library Impact: Putting the Standards for Libraries in Higher Education into Action and Scholarly Communication: From Understanding to Engagement. In-person workshops may also be offered at ALA and/or ACRL Conferences. Online offerings would be part of ACRL’s regular eLearning program and could include a multi-week asynchronous course and one or more topical webcasts of 60-90 minutes each in an interactive online classroom. Collaborating with the ACRL Framework Advisory Board in the development of a free online toolkit for the Framework will also be a responsibility of the curriculum designers. In addition to the above, serving as a curriculum designer/presenter involves participating in all segments of the workshop event and development of materials, exercises and presentations. Additionally, it will involve revision and updating of curriculum and materials as needed and possible development of new materials. It is also anticipated that coaching and training of new presenters will be needed in the future. A stipend will be provided for the curriculum development phase and an honorarium will be provided to workshop presenters, along with travel costs presentation (to include flight, hotel, ground transportation, and per diem for meals). Statement addressing the following questions (two pages max for all). 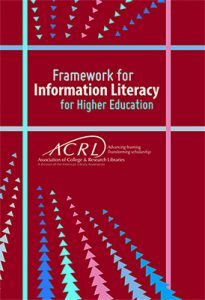 Why do you want to become a curriculum designer/presenter for ACRL’s Framework for Information Literacy workshops? How does your experience qualify you for the role? What contributions could you make to the design/presenter team? Can you provide examples of your teaching/training experiences, with links to instructional materials, video, etc., that demonstrate your abilities as a teacher? Are there relevant experiences of which you would like us to be aware? The names and contact information for two references who have direct knowledge of your relevant experience and expertise. The single PDF application must submitted via email by 5 p.m. Central on Friday, September 16, 2016, to Margot Conahan, ACRL Manager of Professional Development, at mconahan@ala.org. A selection committee with representatives from the ACRL Framework Advisory Board and the ACRL Student Learning and Information Literacy Committee will consider applications and conduct telephone interviews. Applicants will be notified by October 24, 2016. If you have questions, please contact Sharon Mader at smader@ala.org, (800) 545-2433, ext. 5241, or Margot Conahan at mconahan@ala.org, (312) 280-2522.